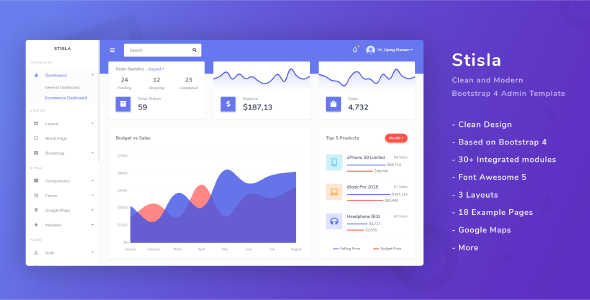 Stisla is a modern and clean admin template based on Bootstrap 4. There are many components, 30+ integrated modules, 15+ sample pages, which will make it easier for you to create an admin page layout. Also, we use the popular CSS preprocessor, namely SASS with the SCSS syntax. That way, you will be easy to adjust the color, font type, and other CSS rules. We have overwritten Bootstrap’s default CSS rules so that they conform to Stisla. In addition, you can customize the components that are already on Stisla with your needs. Almost all of our Bootstrap 4 components are overwritten to have a cleaner and more convenient interface for your admin page users. There are at least 70+ pages on this template and 18 of them are sample pages such as (Posts, Settings, etc), which can speed up your project. Stisla does not use free images such as those provided by Pexels, Pixabay or the like. Stisla uses self-made placeholder images, so you don’t have to worry about image licensing issues. Most importantly, don’t worry about documentation, we have arranged it so you don’t get lost. Stisla is usually used for ecommerce projects, blogs, SaaS, company profiles, and other projects that require an admin page, because with Stisla you can adjust whatever layout and components are needed. Speed up your project with several pre-built pages available. Stisla has many components, and some of these components are integrated with one of the modules below because 30+ third-party libraries have been integrated with Stisla. We overwrite the CSS rules in Bootstrap 4 default so that the colors and typography adjust the template. We use Gmaps.js to create a Google Maps component. So, you can make more components with Gmaps.js. Most importantly, prepare API KEY, because we use Google Maps API V3. Don’t worry, by reading the documentation you won’t get lost. We wrote only a few important things documented, more clearly you can see on the page in the template. We strongly emphasize that you first try Stisla on the demo page before buying it. You will also get support from you if needed, send us an email at [email protected] with the subject (Stisla Support – Your Subject). We will prepare 1-3 working days, please be patient. If you buy this template, don’t forget to give us a review, give us a comment so we can improve what needs to be improved and must be improved. It doesn’t have to be 5 stars, honesty is more important.